A veteran energy consultant who penned the leaked draft of a high-profile grid study for Energy Secretary Rick Perry is speaking out about speculation that the report has been politically tainted. Alison Silverstein, an independent consultant who served as an adviser to former Federal Energy Regulatory Commission Chairman Pat Wood III, also confirmed her work pointed a finger at low demand for electricity and cheap natural gas as the drivers of coal and nuclear plant closures, and renewables and regulations as exacerbating the problem. The draft review also concluded the current level of renewables does not pose a threat to the U.S. electric grid, she said. "When I left Washington, I was pretty comfortable with the technical quality and credibility of the report," Silverstein said. Silverstein said she was responsible for reorganizing and rewriting a draft version of the grid study that included contributions from across the Energy Department and national laboratories, text that leaked to the media. E&E News reported about missing text in the report Monday. She said she handed off a constantly evolving draft of the report to DOE on July 7 before returning to Austin, Texas. Perry first requested the overdue study in April. "I walked into DOE back in May and said, 'Here's the deal, I will take this nearly impossible job, but I will walk if anyone tries to put political pressure on me to try to tell me what the answer is you want, and I will walk away if anyone tells me what to write,'" Silverstein said. "I made it clear almost every day that I was ready to make that walk if pushed, and everybody got that." Silverstein said Travis Fisher, a Trump political appointee at DOE tapped to lead the study, gave her a "healthy degree of skepticism" on some points that needed more research, but added, "That's his job as a responsible federal official. "I personally experienced no political interference," she said. "I did experience pressure from other offices, but those other offices were not the ultimate deciders as far as I know." The highly contentious study, a June 26 version of which leaked to the press last week, has touched a nerve inside and outside DOE. At issue is a strongly worded memo from Perry that gave staff 60 days to review the closure of "baseload" coal and nuclear plants and "market-distorting effects of federal subsidies that boost one form of energy at the expense of others." Adding to the intrigue is Fisher's past comments about the effects of federal subsidies and rules as an economist for the Institute for Energy Research, a nonprofit energy think tank that advocates "free-market" energy and environmental policy (Greenwire, April 19). Former DOE officials from both Republican and Democratic administrations agreed the process of crafting, vetting and assembling complex studies at DOE can be a messy and frustrating process, one that pits certain offices within the department against each other. The department's most recent secretary, Ernest Moniz, for example, once described assembling the sprawling Quadrennial Energy Review as a "painful process" that tested congressional patience, and urged veteran Democratic operative John Podesta to come back and help "close" the deal (Greenwire, Oct. 20, 2016). What makes Perry's exercise more contentious is the speed and scope as it cuts across various agency offices and national labs, political ranks, and possibly the White House, said Dan Reicher, an assistant Energy secretary under President Clinton and a member of President Obama's transition team. "So the folks in the fossil office not necessarily agreeing with the efficiency and renewables office, not necessarily agreeing with the nuclear office or the electricity office," he said. "You then have the layer of review of the political leadership all the way up to the secretary." Reicher suggested such complex DOE studies in the past would have taken months or even years, not weeks. "It's a highly controversial topic inside of a highly controversial administration where there's a lot at stake, at least in theory," Reicher continued. "It's not surprising pieces of this are being leaked because there's a high level of distrust going multiple directions, and there's a lot at stake inside an administration where there's a very large amount of leaking going on." Yet another former DOE official under the Obama administration who asked not to be identified pointed to the array of open houses and symposiums, public comment periods, and livestreamed events that surrounded the compilation, vetting and release of the QER. "If you want to do a serious study on the grid, if you want to do a serious study on U.S. infrastructure and you want to do it where the technical rigor and transparency is beyond question, then you go through a process the DOE went through with the QER," the source said. "If you want to have your results questioned, then you get it this way, which is a accelerated, secretive, nontransparent process, and then a leaked product." A former DOE official who worked under the George W. Bush administration disagreed and said many secretaries come in with ambitious projects or reviews and are often handcuffed by the appropriations process or other factors. 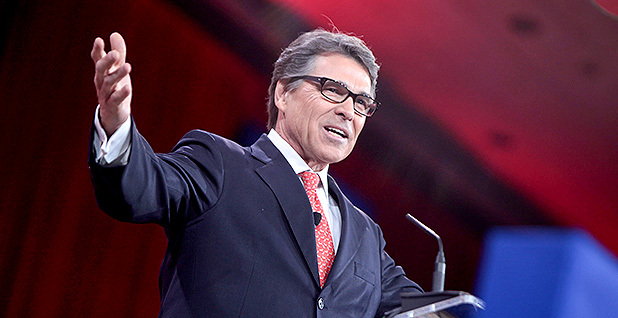 Some industry experts have offered that Perry's hands will be similarly tied (Climatewire, July 18). "'We're going to study this or that, we're going to blow it up and start over,' I've heard it all," said the official. "At the end of the day, there's just only so much you can do, a lot of it constrained by appropriations."